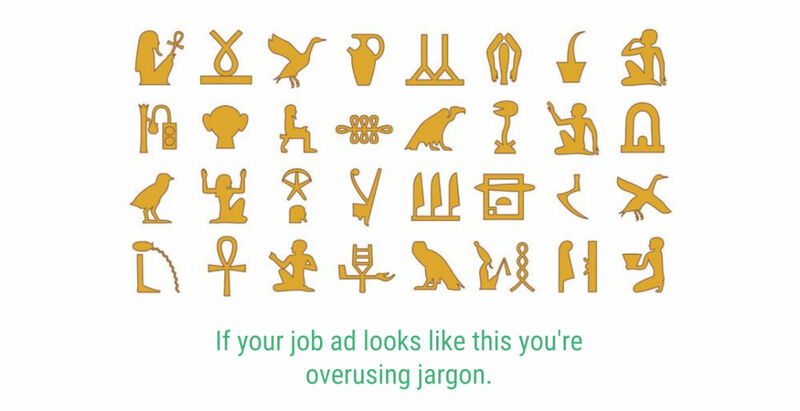 Why You Need to Stop Using Jargon in Your Job Ads, Right Now! Home All Articles Why You Need to Stop Using Jargon in Your Job Ads, Right Now! OTE. Pro rata. Proven track record. Self-starter. Dynamic environment. Yada yada yada. A quick skim read of some job ads will quickly reveal that such phrases and acronyms make up precisely 99% of the total description. And whilst I don't deny that your working environment is nothing short of dynamic, or your OTE is not lucrative, there's one thing that's definitely repelling quality candidates: jargon. Why do job ads contain so much jargon? The term 'jargon' can refer to anything from specialist language to words that overcomplicate something. Often used in fields of politics and academia, jargon is an expression of intellectual prowess, done in such a way that assumes the reader should understand it. And while it might make the jargon-user feel like they're worthy of joining Mensa, it leaves a lot of readers alienated - left in a confused haze trying to decipher something that could have been said in a much simpler way. Of course this is a sweeping statement, and I am aware that certain types of jargon are to be expected / necessary in some industries. I'd always expect to see the acronym OTE (on-target earnings) in a job ad for a sales position for example. After all, it effectively refers to commission potential, which is an important consideration to make in such a role. The problem arises when the ad becomes too saturated with jargon words that you actually struggle to understand what the role will entail. The core elements of a job can be lost behind a mask of metaphor and corporate gobbledegook. That's where we can help. 66% of young people who assessed company vacancies didn't understand the role they would be applying for. Below we've listed some of the most commonly-used jargon phrases in modern-day job ads, together with their 'real world' meaning, and offer simpler alternatives to use in their place. Last time I checked, 'streamlining' involved lycra, funny shaped helmets and wind tunnels. In this instance though it basically means 'to make more efficient'. Instead of simply saying this though, many companies feel that the word 'streamlining' makes them look cutting edge and cool. What it actually does is make a lot of candidates develop a certain perception of the company before they've even finished reading the ad. That perception is one of them being highly corporate, very serious and difficult to work with. "But my company is corporate and we want to be taken seriously!" I hear you. But you can still achieve this image without using unnecessarily obtuse words. Just be as transparent and as simple as possible. Alternative phrasing: 'increase our efficiency as a team' or 'complete projects more efficiently'. Okay I don't hate this one, but I do hate how much it gets used. It features in almost every job ad you come across - which isn't a good thing! It just makes your ad look the same as every other. Jargon essentially makes us unfamiliar with terms and tasks we are actually familiar with. Alternative phrasing: In order to stand out a little more and avoid the dastardly 'd' word, why not try 'a highly stimulating workplace' or 'an exciting and ambitious company'. Unlike my indifference to the aforementioned, I have a thorough hatred for this term. First of all, why would you want anyone other than a self-starter? It seems like a waste of words to begin with. Anyway, a 'self-starter' is somebody who can start oneself. Isn't it obvious?! When a job ad says this, it basically means they want somebody who is motivated, driven and independent (all three of which are better descriptive words than self-starter). I challenge you to find an employer who never wants any one of these attributes. Alternative phrasing: 'show initiative', 'the ability to work independently'. Ahh yes. Here's the best one. Liaise could well be my least favourite word in the English language (yes that includes profanities). Why companies still choose to use this word instead of 'communicate', 'interact' or 'work alongside' is beyond me. 'Communicate' is a powerful, universally understood word. So is 'interaction'. Even the word 'converse' is better (only marginally mind) than liaise. Bleurgh. Another top tip: as an employer, not only should you avoid writing this word into your job ads, you should also never vocalise it. Never say to someone "can you just liaise with "
It just sounds pretentious. But maybe that's just me? Alternative phrasing: 'work alongside', 'work with', 'communicate with'. This is another common offender. Instead of simply stating 'following company procedures', many job ads will say it this way instead. While it's still pretty clear what they mean, the phrase 'in line' isn't natural language to many of us. And that's the whole point of this article. Jargon essentially makes us unfamiliar with terms and tasks we are familiar with. It's just dressing them up in a corporate disguise which can lead to candidates feeling inadequate and incapable of acquiring the role. Alternative phrasing: 'follow company procedure' or 'adhere to company guidelines'. 1. Keep sentences short and simple. In other words, avoid using lengthy, elaborate language that will require candidates to use a thesaurus to translate. Common sense would suggest that if you rarely hear the word spoken, or see it written down, then avoid using it. Shorter sentences also keep people engaged better, and relay information that will stick. Avoid sentences that involve subordinate clauses and a ream of acronyms. 2. Ensure acronyms are always explained. On the subject of acronyms, always ensure they're explained clearly. "But they should know what the acronym stands for if they're capable of doing the job!" is an attitude many might take, but don't. Take some time to consider the language you use. It could well be the difference between finding or fending off the perfect candidate. Acronyms can vary dramatically for certain roles or software systems, so even though a star candidate might actually be able to fulfil all duties of the role, they may be put off because they don't fully understand three puzzling letters. If it's absolutely necessary to use an acronym, ensure its full meaning is outlined in brackets. Eg. CRM (Customer Relationship Management). 3. Consult the current job holder when writing the job description. Although this isn't always possible (if you're recruiting for an entirely new role for example), it's a good idea to get some help from the person / people currently operating in the role, in order to fully understand what their job entails. This means that your description of the tasks involved will be as accurate as possible, ensuring no misinterpretations. Asking somebody who already operates in the role also means that they will describe their job in as simple terms as possible, resulting in a better job ad. You can read Grace's full article on writing effective job descriptions here. 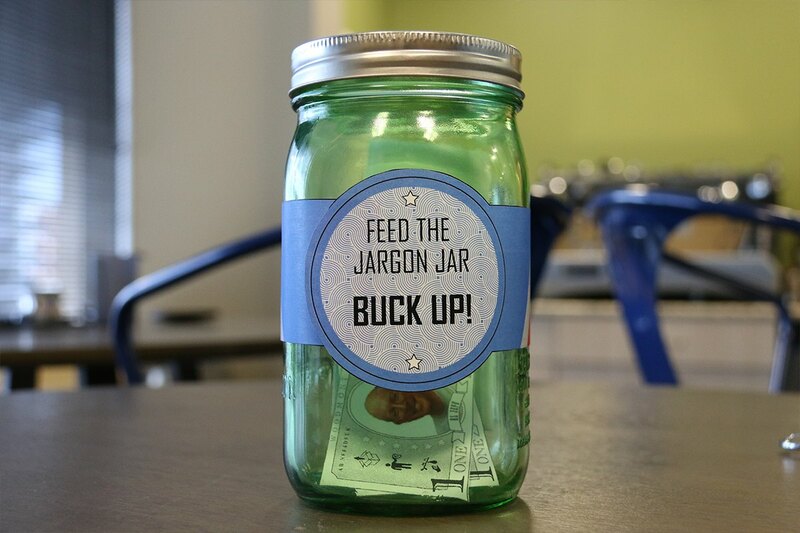 How many contributions would you have to make to the Jargon Jar with your previous job ads? Will jargon ever die out? Simple answer? Yes and no. Some industries do, and always will, rely on jargon more than others. In IT for example, there are all kinds of acronyms used to describe operating systems, tasks and software. That's just the nature of technology and will likely never change. However, sales roles and creative roles are certainly becoming more aware of the issues jargon can cause when searching for the right candidates. One initiative that's recently started up is Business in the Community's Jargon Free Jobs campaign on Twitter. By using the hashtag #JargonFreeJobs, you can see (and contribute) examples of jargon and ways to avoid using it. With over 22,000 followers on Twitter, the initiative is certainly gaining traction. "By analyzing the hiring outcomes of more than 10 million job posts a month, Textio predicts the performance of your listing and gives you real-time guidance on how to improve it. On average, hiring teams with a high Textio Score recruit 25% more people qualified enough to interview and 23% more womenand they do it 17% faster." So there you have it. Next time you're writing a job description just stop and take some time to consider the language you use. It could well be the difference between finding or fending off the perfect candidate. Got a spare two minutes? Why not test yourself with this jargon quiz to see how many terms you know!